Leverage the power of Google Maps by bringing it into your SCADA/HMI project. Using the Image Component, you can easily bind the image path to a Google Maps API URL. Then you can bind to other components, using property binding expressions, to dynamically alter the map. You can display a map and allow users to interact with it by typing in locations, zooming in and out, etc. You might want to put buttons or images on top of the map that users can click on, or mouse over, to display data or perhaps open another screen. We've done most of the hard work for you so you can start off with a pre-developed screen and simply modify it. Step 1: Go to http://code.google.com/apis/maps/signup.html and sign up for a Google Maps API Key. You'll need this later. Step 3: Open your FactoryPMI Designer, right click in the "Project Browser" panel and choose "Import Window." Find the GoogleMapsStaticAPI.fwin file you saved in step 2. 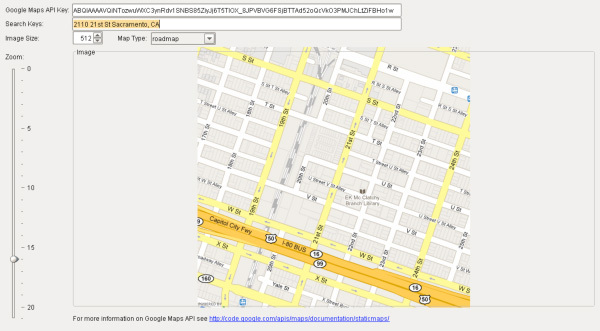 Step 4: Open the GoogleMapsStaticAPI window, select preview mode, and type in your Google Maps API Key.